Long before the war on waste, two central Queensland sisters, Colleen Livermore RSM and Carmel Boyle PBVM, picked up the fight and found a way to give back to charity at the same time. Their actions have not gone unnoticed by the media, with the ABC featuring them in a recent story which is featured below. 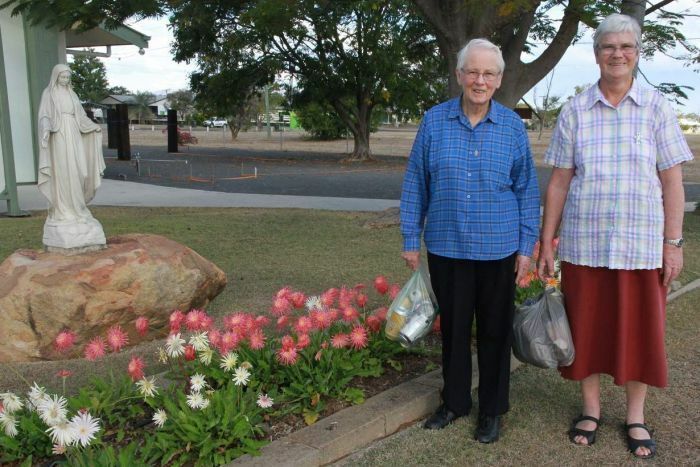 Long before the war on waste, two central Queensland nuns picked up the fight and found a way to give back to charity at the same time. 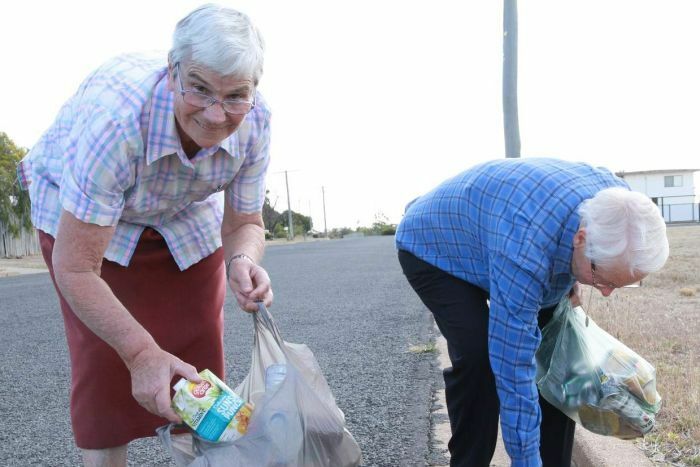 Every morning for the past 10 years, sisters Colleen Livermore and Carmel Boyle have walked through the town of Blackwater picking up rubbish as they go. Originally their rubbish walk was a way of beautifying the town, but the sisters quickly realised their recycling efforts could also help those in need. Any aluminium cans they pick up are taken to a nearby scrap metal company where they are given two cents per three metal cans. “That two cents might be able to buy a meal for someone, in another country even. So that’s what we did,” Sr Carmel said. Sr Colleen admitted they found the thrill of the chase, searching for cans, is a little addictive. “There’s great excitement. We come back and we say ‘oh we got seven or eight today! '” she said. While there is not a lot of profit in what they do, Sr Carmel and Sr Colleen said the commencement of the Container Refund Scheme will help increase their return. From November 1, there will be 230 refund points across Queensland where people can collect 10 cents for each empty drink container they return. “It all counts and it all adds up,” Sr Carmel said. Blackwater, like many central Queensland towns, is on the way up following a mining downturn. In recent years Sr Carmel and Sr Colleen played a significant role in the community in a support network for anyone who needed help. “People know us, so we’re not confined to just the Catholics here,” Sr Carmel said. “If someone is in trouble or needs some help, or advice, they’ll turn up at the door and say ‘the others said go and ask the sisters’, so that’s what happens. The Sisters are part of the Blackwater Parish and live together on site at the church. “I’ve been here 13 and a half years,” Sr Carmel said. Sister Colleen followed two years later. She said before their arrival there had not been any nuns in the town for almost 10 years. Blackwater was recently awarded the Tidy Town award, the first to receive a five-star rating. The competition is run by Keep Queensland Beautiful, and Blackwater scored high across all nine focus areas — environmental innovation, protection, heritage and culture, community spirit, litter action, resource recovery, waste management, water conservation and energy efficiency. Blackwater was originally just a stop on the railway line, but has since grown to earn its title as the ‘coal mining capital of Queensland’ through its location and export earnings. The sisters said it was nice to see Blackwater in a positive environmental spotlight. “I was amazed when I saw Blackwater won the Tidy Town. Blackwater doesn’t get on the map for a lot of good things,” Sr Colleen said. Central Highlands Mayor Kerry Hayes said the community is extremely proud of the new title. “We’ll have that bit of a byline — ‘keeping it tidy in Blackwater, we’re a five-star place’,” he said. Cr Hayes said it was important for people to see Blackwater as more than a resource community. “This award and its criteria show that it has plenty to offer and cares about its future,” he said.